Milwaukee has been an industry leader in manufacturing heavy-duty power tools that excel in both, performance and durability for almost 100 years. They introduced the first portable, lightweight capacity drill in 1924 and have continued to design heavy-duty electric power tools that are trusted by professionals around the world. Today, they manufacture over 500 different tools that meet the ever-changing needs of the world we live in and produce more than 3,500 accessories that help the user work smarter and faster. The first modern electric power tool was invented in 1895 by a German company C&E. However, the drill weighed 16.5 lbs and required more than one person to use it. It was slow and weak compared to the modern tools we see today, but it revolutionized the tool industry and opened the doors to innovation and invention. Today’s power tools are powerful, compact, and lightweight and can be found in homes all around the world. Whether you work in a garage, factory, or enjoy doing work around the house, electric power tools can make your life easier. Unlike manual tools, which require brute strength and more time, power tools can get the job done quickly and easily. But not all power tools are the same, and if you are going to spend the extra money, you should at least opt for a quality product that will last. Milwaukee tools are some of the best in the world, and in this review, we will be going over some of the best power tools that they make. 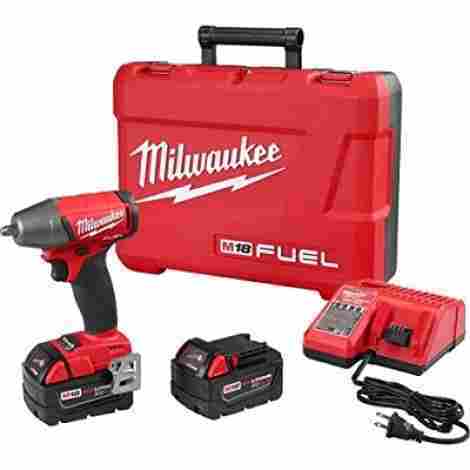 This fantastic combo kit from Milwaukee comes with everything you need, including a 12-volt half inch compact drill/driver, a 1/4 inch hex impact driver, two compact lithium-ion batteries, a belt clip, a charger, and even a carrying case. Although they are compact and lightweight, they still pack a punch and comes with lots of great features that allow you to change speeds and inform you when the battery is running low. This is a great set to have at home and you can easily bring it with you to off-site jobs. No job is too hard for this drill driver and hex compact combo set. The high-performance hex impact driver features Milwaukee's unique 4-pole frameless motor and can deliver up to 1400 inch-pounds of torque. The drill driver also puts out 400 inch-pounds of torque to help you drill through some of the hardest surfaces. 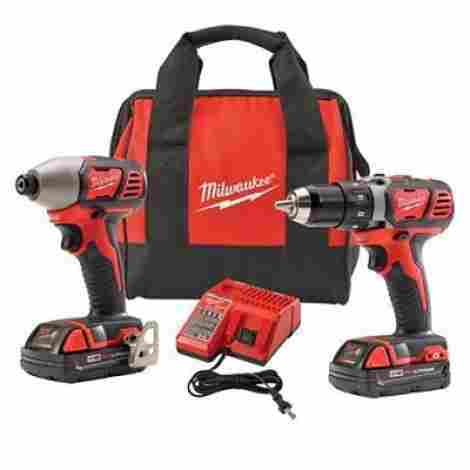 Although cordless power tools are usually not as powerful as compressed air or corded power tools, this combo kit uses Red Lithium, which uses superior technologies and design to deliver a longer running time and more power. Both drivers also feature battery fuel gauges the let you know when you need to recharge. Unlike other power tools that don't even include the batteries, this combo compact driver and hex impact driver comes with all the accessories you need to get the job done. It also comes with soft carrying case for easy portability. This one-handed reciprocating saw made by Milwaukee is just another example of how the company consistently manufactures high-quality power tools that are a cut above the rest. The ingenious one-handed design allows for incredible control and versatility and enables you the freedom other reciprocating saws can't give. It also has some great features like built-in LED lighting that spotlights the area you are working on for extra safety and accuracy. Versatility is essential for a reciprocating saw, especially when cutting in hard to reach places. Milwaukee made this compact and lightweight so you can efficiently work in tight spots and even makes overhead cutting simple. Surprisingly, this compact cordless saw produces 3,000 strokes per minute at a stroke length of 3/4inch stroke length, which enables you to cut through some of the hardest surfaces such as PVC and metal. But even with all that power, the dual gear anti-vibration system allows for better control and increased accuracy. The Hackzall cordless reciprocating saw is great for small and big jobs alike and is compatible with M18 compact Lithium-ion batteries and M18 XC high capacity lithium-ion batteries. The QUICK-LOK blade clamp means you can quickly and easily switch blades whenever necessary. This sub-compact ratchet runs on an M12 lithium-ion battery and can produce up to 250 RPM and 35lbs of torque, similar to the speed and power you would find in a pneumatic ratchet. Its size allows for easy portability, and the 3/4inch low-profile head makes it a perfect tool for auto maintenance and repair. The reinforced steel housing provides maximum durability for even the toughest jobs. One of the most significant issues cordless ratchets face is overheating from too much power. Redlink Intelligence, which is a built-in smart chip, prevents this from happening by communicating with the battery. This also avoids unnecessary damage and prolongs your tool's lifespan. When you are laboring on an important job and need to get it done quickly, a mistake can be costly and time-consuming. Milwaukee put a recessed forward and backward switch on the backside of the head in order to prevent accidental actuation while working. At only 10-3/4 inches long and less than 2-pounds, this sub-compact ratchet can comfortably fit on your tool belt, and the 3/4inch low profile head means that you could use it in small spaces including engine bays. It has a robust 12-volt motor is made from reinforced steel for many years of reliable use. As one of the most powerful compact impact drivers among its competitors, the Milwaukee M18 hex impact driver is the perfect tool for jobs at home and in the workplace. Milwaukee uses its patented technology to optimize performance while protecting against overloading and damage. It has some great features such as LED lighting for better illumination and an all-metal reversible belt clip for storage. Milwaukee's specially designed brushless motor comes with four times more power generating components than its competitors. This allows it to not only put out more power than the others, but it also produces a longer runtime and gives your tool a longer life as well. 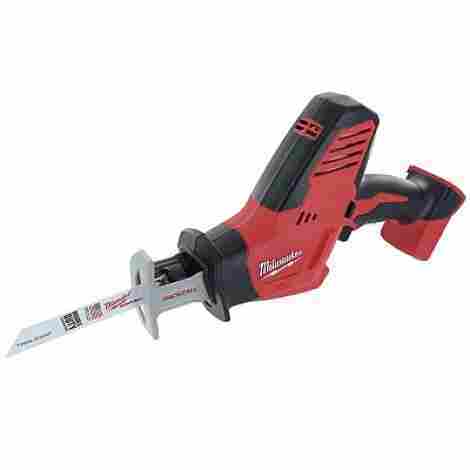 This patented Milwaukee feature gives this tool the most power to size ratio among all other competitors in its class. You can expect an astounding 3,450 IPM, 2,750 RPM and 1,500 in-pounds of torque for the ultimate performance. This sturdy, yet lightweight, hex impact driver features many of the innovative designs that have helped Milwaukee stand out as one of the best power tool manufacturers in the world. Its Redlink technology also protects from overload by using a system of communication between the battery, tool, and charger. If you're looking for something lightweight, yet powerful enough to handle tough jobs in electrical, plumbing and carpentry, then this is the tool for you. 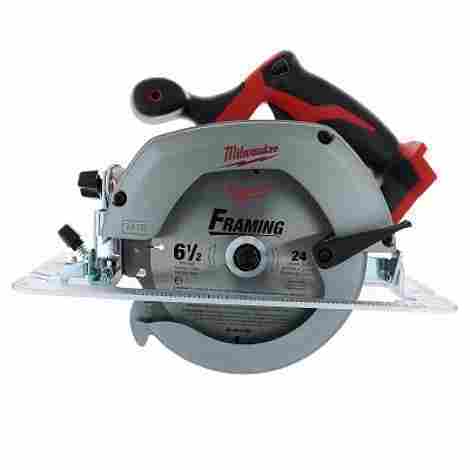 The M18 6-1/2-inch circular saw is a durable machine that features an impressive 3,500 RPM motor that gives you enough power to cut through laminated veneer lumber quickly. The aircraft aluminum shoe is easy to read and allows for higher accuracy. Safety should always be a priority when using power tools, especially saw. Milwaukee designed this with heavy-duty magnesium lower and upper guards that not only protect you but also protects the edge of the blade from drops. Comfort and balance are essential when handling circular saw as it allows for greater accuracy. This features a soft grip handle and is ergonomically designed to be compact and lightweight for easy control and maximum comfort. Its size and power make it ideal for portability, and the magnesium guards ensure the best durability in a cordless saw. It also has a built-in battery fuel gauge that lets you know how much run-time is remaining, so you don't have to worry about it dying in the middle of a job. The Milwaukee M18 cordless half inch impact wrench is considered an industry leader as the most compact, longest running, and the most powerful impact wrench of its kind. The variable speed trigger allows you to change the speed between 0-2200IPM and 0-1900 RPM for optimal control. It also has some great features that help decrease downtime and superior ergonomics that allows comfortable use even during prolonged times. When you're working on a time limit, it's important that your tools are charged and ready to go. Milwaukee included a real-time battery fuel gauge that built-in and allows you to monitor the charge. The impact wrench also has a friction ring so you can quickly change sockets with one hand. This half inch, high-torque impact wrench features Milwaukee's specially designed impact mechanism and a 4-pole motor that delivers an incredible 450 feet-pounds of torque with a longer run time than any other impact wrench in its class. Not only is this high torque impact wrench considered one of the best in class, but it is also very durable, compact, and lightweight, making it the ideal tool for at home and in professional settings. Its high torque output allows you to take on toughest jobs with ease. 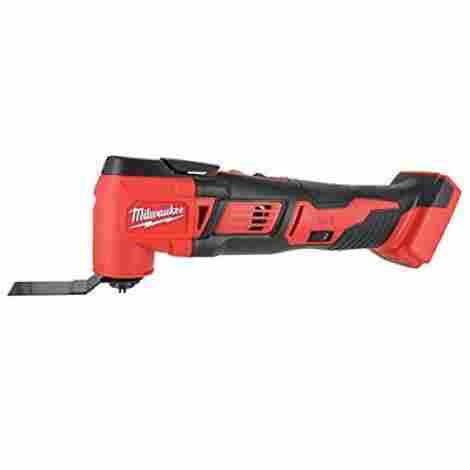 Whether you're doing a DIY renovation project at home, or need something tough and durable at the workplace, this cordless orbiting multi-tool from Milwaukee just as dependable as it is versatile. You can grout, cut or polish with the accessories that come with it, but that's only a portion of what this tool can do. Compatible with tool accessories from both, Milwaukee and competing brands, this is the only multi-tool you will ever need. This orbiting multi-tool is just as effective with intense cutting jobs as it is with delicate sanding jobs. 12 different speed settings ranging from 11,000 to 18,000 OPM can be switched within seconds. Working in a construction environment means that there will be some impacts on the job. The all-metal gear case ensures that your tool can resist the strenuous conditions while prolonging its longevity. The handle is also covered with a rubberized mold to keep it from slipping. Not only does this tool come with all the great features typically found in other Milwaukee M18 products, such as Redlink technology, LED lighting and built-in fuel gauge, but it is also compatible with accessories from other brands. This compact impact wrench kit comes with everything you need, including a heavy-duty storage case, a battery charger, and two Redlithium batteries to keep you going. The 3/8 inch compact impact wrench produces 210 feet-pounds of torque, which makes it the most powerful in its category and delivers 20% more run time than its competitors. It also features an advanced electronic system that leads the market in innovation. The specially designed Redlitium batteries are exclusive to Milwaukee tools and deliver 20% more power, two and a half more runtime, and lasts two times longer than the standard lithium-ion batteries. Its superior construction also protects it from harsh work environments. When working on projects that require accuracy and precision, it's vital that you have complete control over your tool. With the 4-mode drive control, you have full control over power and speed with mode 1 delivering 0-900 RPM, mode 2 delivering 0-1600 RPM, and mode 3 delivering 0-2500RPM. The M18 compact impact wrench kit provides you with everything you need to get the job done and adequately store your tool. It is the leading impact wrench in its class and features an electronic system that prevents overloading and overheating to avoid any damage to your battery and tool. 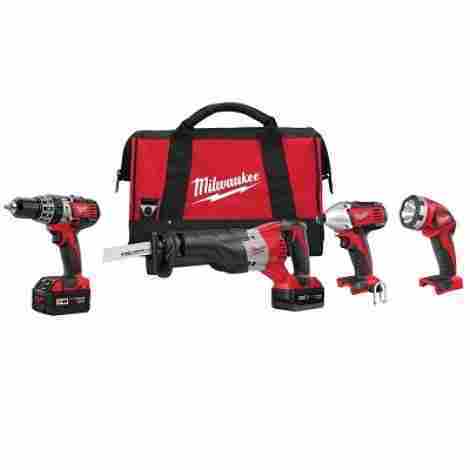 This four tool combo kit from Milwaukee is a power tool enthusiast's dream. The kit comes with a Sawzall reciprocating saw, half-inch hammer drill/driver, quarter inch hex impact, and an M18 work light. To top it all off, you also receive a 1-hour charger, 2 XC Redlithium batteries and strong contractor bag to hold and carry all your tools. Having high torque power is important for the tougher jobs and these tools have it. The M18 hammer drill/driver has 550-inch pounds of peak torque, and the M18 hex impact delivers 1400 inch pounds of torque for some amazing power. This cordless combo tool kit come is designed to make your life easier. It comes with two high capacity Redlithium batteries for continues work and a quick charge charger. The M18 work light features a 135-degree rotating head and a fold-away hook that allows for hands-free work. 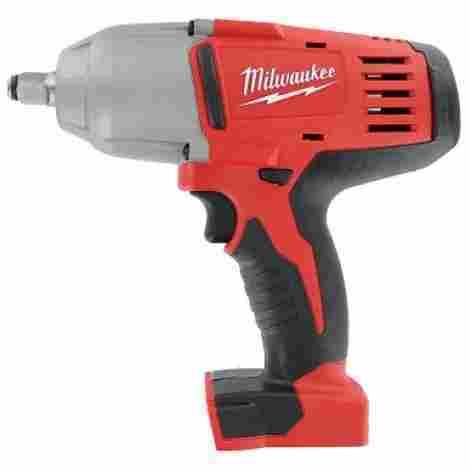 All the power tools feature Milwaukee's patented electronics, technologies, and innovative motor design that makes this company an industry leader. The superior ergonomic design makes them efficient and easy to use. The M18 compact vacuum features a high-performance motor that is both powerful and lightweight and produces incredible suction that makes it a perfect cleanup tool for shavings, debris, and dust. Convenience played a major factor in the design with a clear view canister that is easy to empty and several accessories to make your job easier. Even with a powerful motor, the M18 compact vacuum can run up to 25 minutes when powered by Milwaukee's Redlithium battery pack. When using the High Demand 9.0 battery pack, you can get up to 43 minutes of use. The primary purpose of using cordless power tools is because they are more convenient. This compact vacuum comes with several accessories that give it more versatility, including a crevice tool, 4inch flexible hose, removable HEPA filter, two extension wands, and a floor tool. A clean workplace is a safe workplace, and with this compact vacuum cleaner, keeping your work area clean has never been easier. It comes with all the accessories you need and is strong enough to pick up metal shavings and drywall dust. Milwaukee has changed the power tool industry with its cutting edge technology and innovations. Their tools are rated as some of the best in the world, and they are a trusted brand among professionals and DIY enthusiasts alike. When purchasing one of their power tools you can expect to get high quality and durable product that will not only make your job easier but also safer. Milwaukee’s M18 Cordless System is the company’s latest line of 18-volt cordless tools that combine superior ergonomics, professional-grade power and extreme performance to make them the most powerful tools in its class. Milwaukee has long been an industry leader by manufacturing innovative tools that deliver unmatched durability, power and runtime and their line of M18 tools are no exception. As the fastest growing 18-volt cordless tool line in the world, there are now more than 125 performance-driven power tools in the M18 family. Milwaukee designed their M18 power tools as a compact, lightweight, and powerful solution for professionals in the trade looking to improve productivity with unrivaled performance. Powered by the company’s patented technologies, advanced electronics, and innovative motors, you can count on longer run-time and unmatched power. 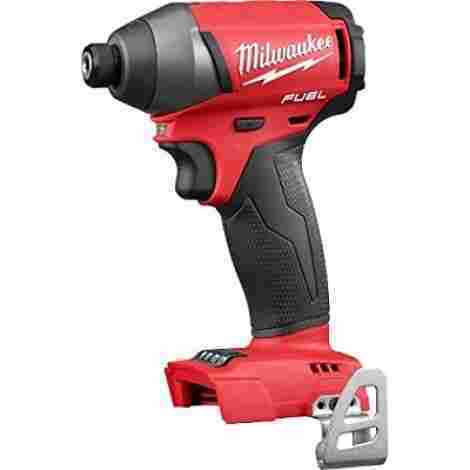 All of Milwaukee’s M18 products feature exclusive innovations you can’t get with any other brand, including REDLITHIUM Battery Pack, POWERSTATE Brushless Motor, and REDLINK PLUS, a built-in intelligence software and hardware. M-18 6-Pk Sequential Charger – This is perfect for the professional who needs to charge more batteries at a time. The compacted design has built-in holes for hanging conveniently which allows you to post it on the wall and save space. You can charge up to six batteries at one time and is powerful enough to fully charge a REDLITHIUM compact battery in thirty-mins and a REDLITHIUM XC battery in just 60 minutes, helping increase productivity. M18 & M12 Rapid Charger – For maximum productivity, this charger charges 40% faster and is compatible with both, M18 and M12 batteries. Its advanced REDLINK Intelligence system helps extend the life of your battery pack and optimize performance by monitoring temperature, charge statues, and cell voltage. Created with the professional tradesman in mind, Milwaukee’s POWERSTATE Brushless Motor is specially designed to deliver more torque, speed, and durability than all its competitors. In place of wearable brushes, it uses more copper and steel to reduce friction and heat buildup while increasing efficiency and motor lifespan. It also features better quality rare earth magnets, which allows it to work harder than other leading brands in its class. The advanced technology helps the motor convert energy into torque and power with less noise and heat for longer maintenance-free performance. Milwaukee’s exclusive REDLINK Intelligence System was created to communicate with the motor, battery, and charger in an effort to protect your tools and battery whenever overheating or overloading is detected. During heavy-duty jobs, a motor’s RPM decreases and causes heat to build up, which will eventually melt the wiring and windings and cause the motor to fail. REDLINK prevents this and preemptively protects the battery and drill whenever overheating is detected. By continually monitoring these issues, it allows your tools to work at peak condition at all times. Comfort is paramount when working with power tools. If your cordless power tool is too heavy, unbalanced, or difficult to handle, fatigue can set in, and that’s when accidents happen. 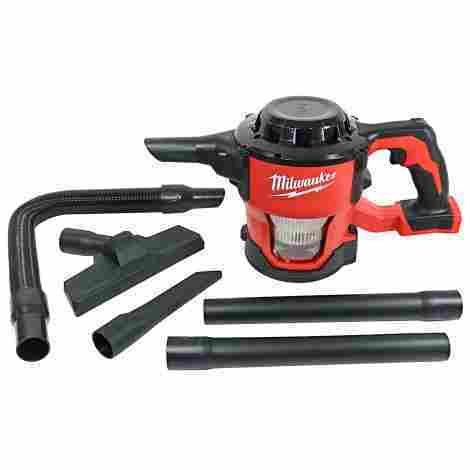 Milwaukee uses their innovative technology to pack in the most power possible in a lightweight, compact tool. Their M18 line of cordless power tool features superior ergonomic designs to ensure maximum comfort during extended periods of use. That includes perfect balance, rubberized handles, and LED lighting. Q: Do Milwaukee power tools come with a warranty? Yes, all of Milwaukee’s M18 Cordless Power Tools come with a five-year warranty. Battery packs and battery chargers also come with a warranty, but the length of that warranty varies with each model so you’ll want to make sure that you take your time and research this information before making a purchase. The warranty covers free replacements or repairs on products that have defects in workmanship or material. It does not include any products that have passed the warranty period or products that are defective due to abuse or normal wear and tear. Q: What if my tool breaks? Does Milwaukee offer any type of repair services? 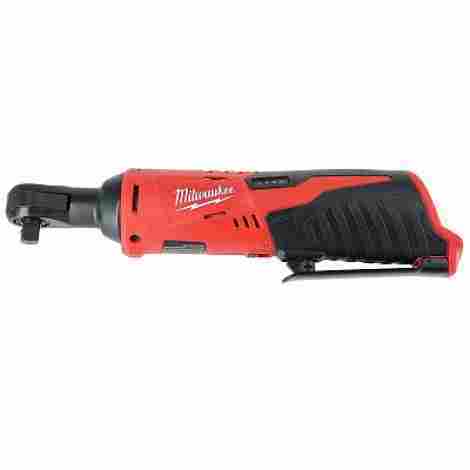 Milwaukee tries to make repairing your power tools as convenient as possible. They offer free FedEx shipping to a Milwaukee repair facility near you and promise to have your cordless power tool fixed within seven to ten days, whether you have a warranty or not. They have factory trained professionals who only use genuine Milwaukee parts to repair your tools. When your tool is fixed, they will return directly back to you, so there is no need to go anywhere else to pick it up. Q: If I need to repair my Milwaukee power tool, why should I use their service center and how do I find one near me? Nobody knows Milwaukee power tools better than Milwaukee. They guarantee that you’ll have your tool back within seven to ten days and all repairs under warranty will be done at no charge. They guarantee great prices and all repairs are done by professionally train technicians. There are hundreds authorized service center located all across the United States and finding the one that is nearest to you is as easy as going on their official website and typing in your zip code or city. Q: I purchased the Milwaukee M18 Orbiting Multi-Tool from a friend, and he no longer has the manual, how do I find out more about this tool? Milwaukee’s official website offers several options when it comes to technical support. You can contact them via email or call the number they provide and speak to one of their highly trained technical support team members. You will also find and download an operator’s manual and material safety data sheet on their website. Q: I have some older M12 batteries that are still good, can I use them on the M18 tools. No, the M18 tools are only compatible with M18 batteries, and the M12 tools are only compatible with M12 batteries.